Line the base of a deep serving dish with 4 trifle sponges cut into 1cm slices. Place the chopped segments from 2 peeled oranges on top. Grate the zest of 2 oranges and 1 lemon and reserve. Mix 40g icing sugar with the juice of 2 oranges and 1 lemon and stir until the sugar has dissolved. Whip 1 x 284ml carton of thick double cream until it just starts to thicken. Slowly add the sweetened fruit juice, whipping all the time. Continue whipping until the cream is light and thickened and all the juice absorbed. Stir in the zest. Pour the cream mixture over the sponge and orange. 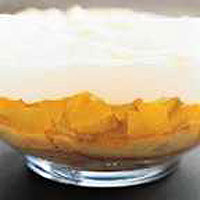 Refrigerate for several hours, preferably overnight, to allow the juice to soak into the sponge and the cream to thicken. Decorate with physalis or orange segments. Pour a drop of Cointreau or Grand Marnier over the oranges.